They're ready for us in Shanghai! This will be an amazing spring! We will soon present three world premieres ( Bates, Crouch, O'Regan) here in the Bay Area, then tour in Connecticut, New York,Georgia and Minnesota, including Youth Choral Festivals in Darien, Connecticut and Hibbing Minnesota. 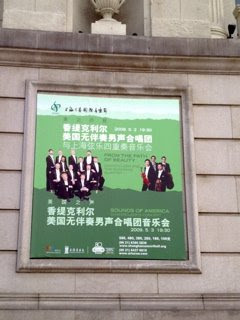 China seems a long way away, but in two months we'll be there, and, as you can see, they're ready for us!